Who else loves subscription boxes? 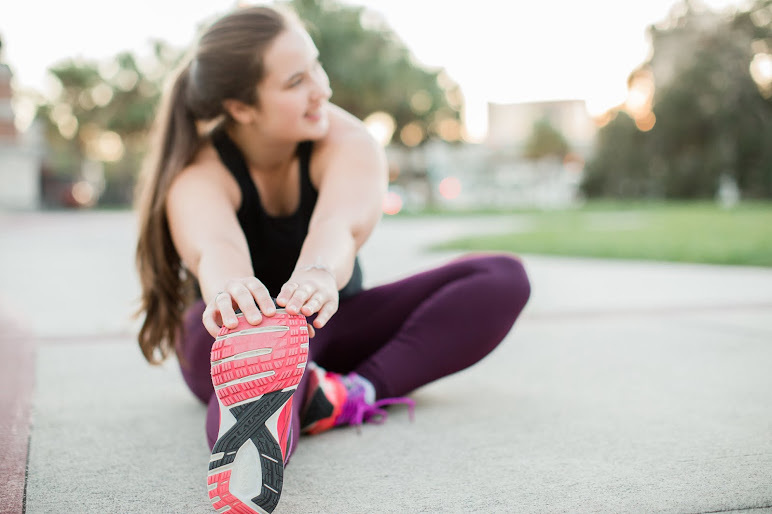 Some of my favorites out there include Fabfitfun and Barkbox! I'm on a budget, so if I get a subscription box it's because I truly believe what comes with it is valuable and is worth the monthly cost. 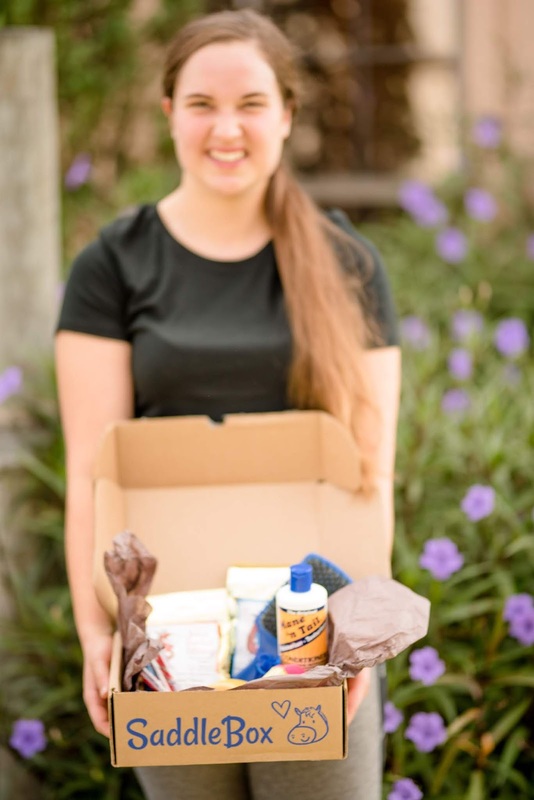 I recently discovered a horse subscription box (that's right horse lovers!) called SaddleBox. 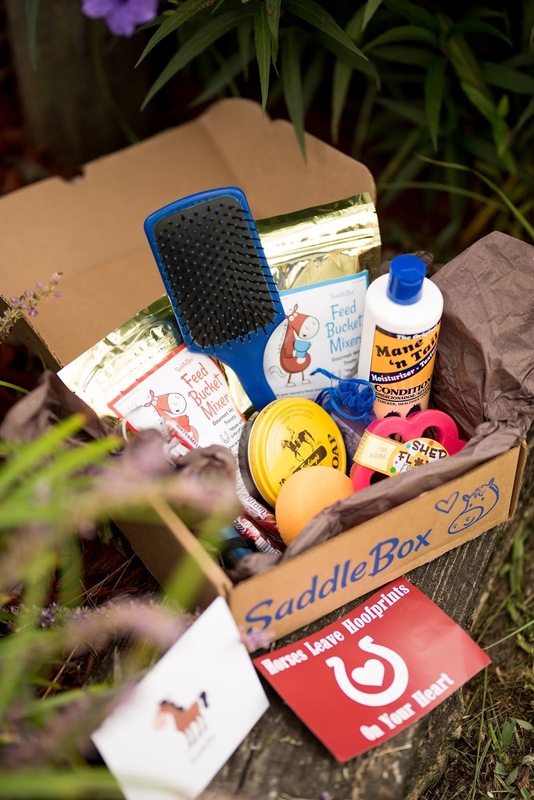 SaddleBox is a monthly subscription box for horse owners that includes treats, grooming products, tack, and more! 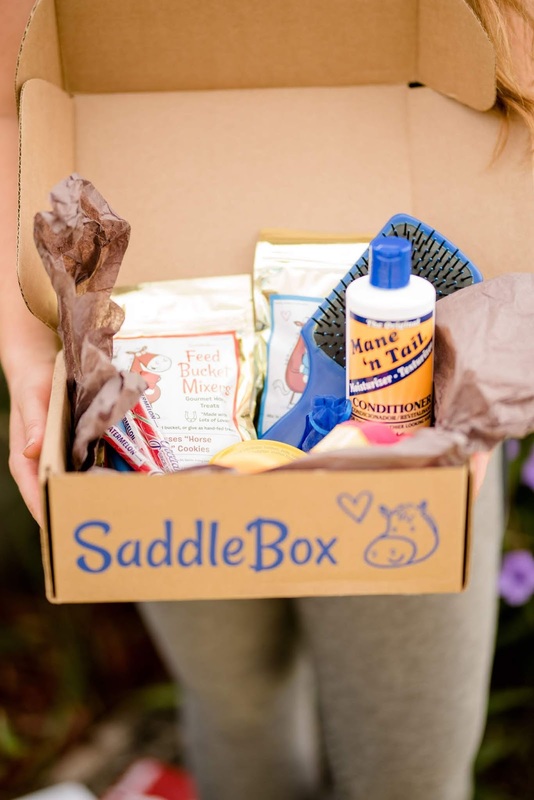 When you sign up for SaddleBox, your first box ships immediately and then all future boxes ship out on the 15th of every month! Plus, shipping is free, which we all love that! Below is a breakdown of everything that I received in my SaddleBox. 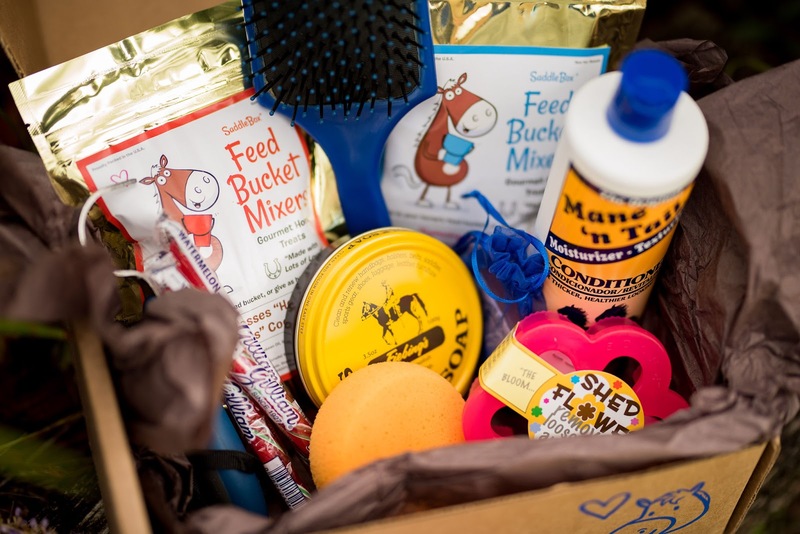 My box came with two bags of treats, a hoof pick, a flower shaped grooming brush, a paddle brush for grooming the mane or tail, Mane 'N Tail conditioner, saddle soap, handmade rosemary & lemongrass soap, a few watermelon flavored candy treats, and a cute sticker that says "Horses Leave Hoof prints On Your Heart" which is so true! I love that SaddleBox proudly gifts treats that are made in the USA. It makes me like this box even more! Let's take a closer look at the horse treats I received. The first bag of treats that I got (left side) are Molasses "Horse Snaps" Cookies! 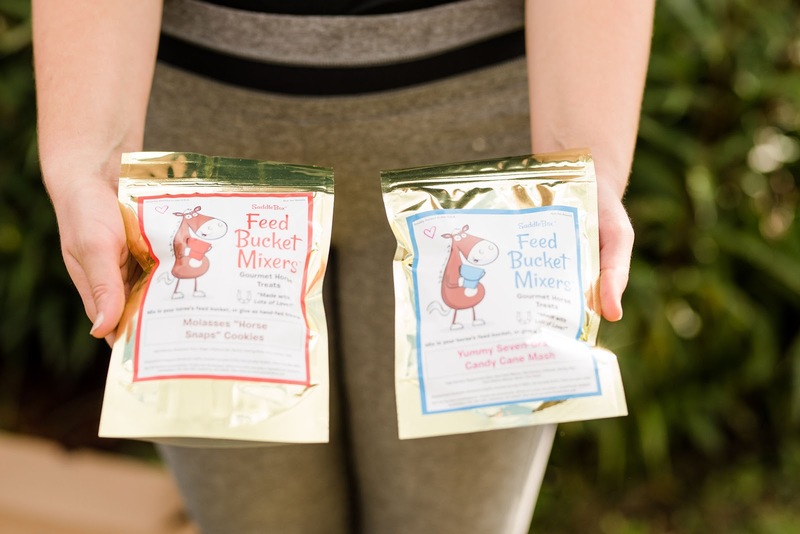 These treats can be mixed in your horse's feed bucket or given as a hand-fed treat! The second bag of treats (right side) are Yummy Seven-Grain Candy Cane Mash. Now, this even looked good to me! Ha! Same with the other bag, you can mix it in their food or give it to them by hand! 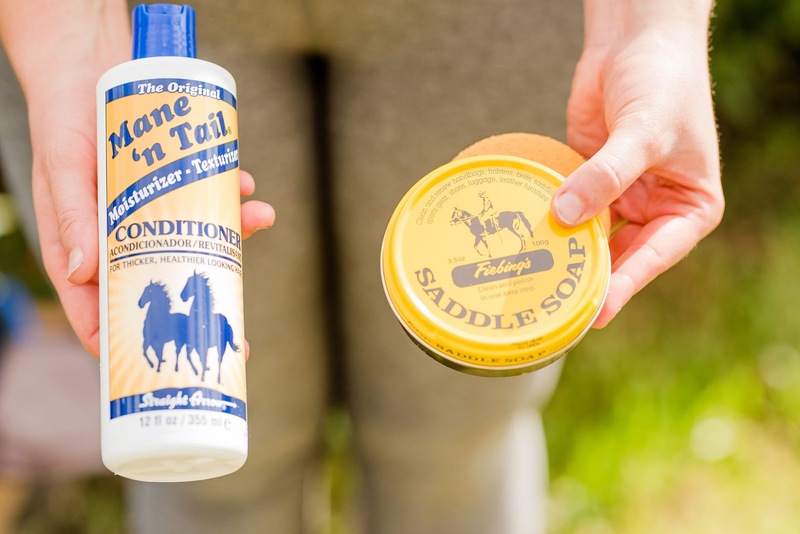 I am super excited to use this Mane 'N Tail Conditioner next time I give Brandy a bath! Grooming horses is one of my favorite things to do. It's so soothing to me. I've heard of this brand before but I've never actually used it so I'm excited. I can't wait to make Brandy all beautiful! I also received some Fiebing's Saddle Soap and a sponge. This polish can clean and renew handbags, holsters, belts, saddles, sports gears, shoes, luggage, and leather furniture! I'm excited to try this out on my tack after my next lesson. The other grooming products I received were this Oster hoof pick, Rosemary & Lemongrass Soap, mane and tail paddle brush, and a Shed Flower brush. I'm really excited to use my new Shed Flower brush because Brandy (and all of the horses honestly) are always rolling in the dirt or even their shavings in their stalls and get so filthy every day. Ha! 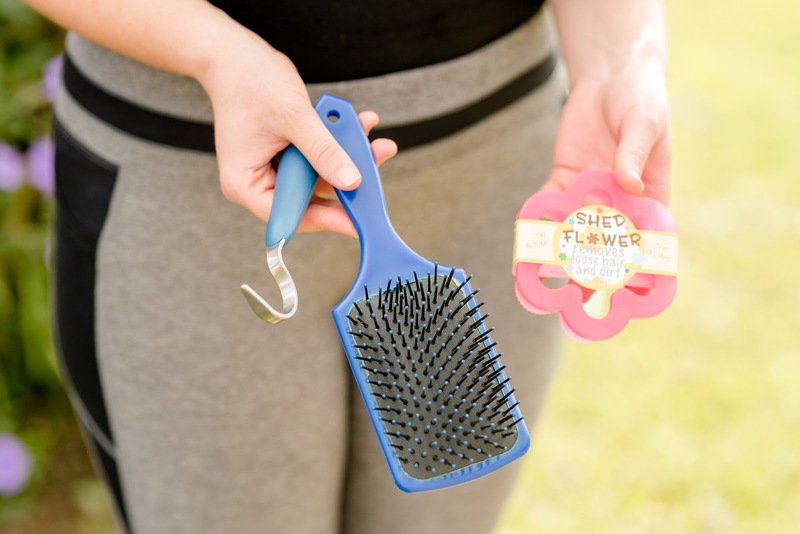 With it's flower shape design for a good grip, this brush easily lifts hair, dirt, and mud quickly off of your horse. A.k.a. every horse owner's dream! The Rosemary & Lemongrass Soap is from the Wyoming Cowgirl Soap Company. These handmade soaps are made by a woman called Laurie Mitchell and every soap has an intricate horse (or some western) carving into them which is really cool. This soap smells so good and is the perfect scent for fall! Are you obsessed like I am? Sign up today for your own monthly subscription, or, you can gift someone this awesome subscription box. Plans start at one month and go all the way up to 12 months! I love that this box is a surprise every month and it's the perfect birthday present, Christmas present (hello holidays coming soon! ), and welcome home gift to anyone who just got their first horse. You can also check out past boxes here to see what other amazing items have been included before! I'd love to answer any questions in the comments below. If you are subscribed to this box already, I'd love to know your favorite thing you've ever received in a box! 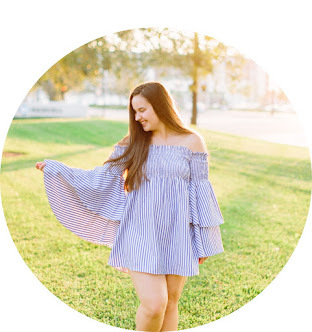 Can You Wear A Romper To A Fall Wedding?